It’s going to be busy from now until mid-May! Radio shows, book signings, StokerCon, Suite & Sour… I have so much news to announce. One of the most exciting (to me) is that I have a page as a Bram Stoker Awards® finalist. That’s a dream realized… you can visit it here. Read Suite & Sour as I write it at Curious Fictions. This is the follow-up to Bitter Suites, a Bram Stoker Award® finalist. My goal is to post a new chapter every week until done. I wrote Bitter Suites on serial fiction site Radish and I enjoyed the interaction from readers. Chapters of Suite & Sour are subscriber only. Subscriptions start at $2 and include access to all chapters. Find more details here. April 15—I’ll be at Crestview Public Library where I’ll be signing copies of Bitter Suites. Copies of issue #133 of Space and Time magazine will also be for sale along with subscription sign ups. I’ll be heading to lunch at Cafe Bienville afterwards. April 16—I’ll be at Niceville Public Library where I’ll be signing copies of Bitter Suites. Copies of issue #133 of Space and Time magazine will also be for sale along with subscription sign ups. I’ll be heading to lunch at Cafe Bienville afterwards. May 9—12 I’ll be at StokerCon, Grand Rapids, MI. ♦Friday, May 10 at 11 a.m. I’ll be a panelist at Writing to Prompts: Prose, Poetry, and Sources of Inspiration moderated by Marge Simon and with fellow panelists Karen Bovenmyer, Michael Bailey, Linda D. Addison and Michael Arnzen. ♦Saturday, May 11 at 2 p.m. I’ll be moderating the panel Writing Just Enough: The Novella along with panelists Ellen Datlow, JG Faherty and Usman Mlk. 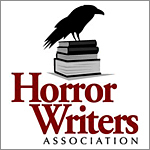 ♦Saturday, May 11 at 7 p.m. is the highly anticipated Bram Stoker Awards® Banquet. I’m thrilled that Bitter Suites is a Bram Stoker Awards® finalist in the Long Fiction category. I will also have the honor of presenting the Bram Stoker, along with Michael Arnzen, for the poetry category. May 15 I’ll be meeting the Grand Patriarch of Space and Time, Gordon Linzner. We will be doing magazine things and (I hope) getting plenty of time to explore NYC. That evening I’ll be honored to be a fly on the wall at KGB Bar listening to poetry and prose read by some of the best writers around. In the early hours (technically May 16) I’m thrilled to be a guest on Hour of the Wolf with Jim Freund. Freund’s guests on the show have included speculative fiction writers such as Douglas Adams, Isaac Asimov, Robert Bloch, Ray Bradbury, Arthur C Clarke, Lester Del Rey, Samuel R. Delany, Thomas M. Disch, Joe Haldeman, Frank Herbert, Christopher Lee, Ursula K. Le Guin, Frederik Pohl, Baird Searles, Norman Spinrad, Kurt Vonnegut, Gahan Wilson, Roger and Zelazny. Hour of the Wolf can be heard over 99.5 FM in the NY metropolitan area, on wbai.org, and can be viewed on Facebook Live. I’ll be sharing here when I can. I’m not going to pretend I’m not excited and impressed by this opportunity. I am. May 16 after the show I’ll be heading out of the city to meet up with former S&T publisher Hildy Silverman. More magazine things and lunch! Afterwards I’ll be driving to Browns Mill’s, NJ to visit The Community News, first newspaper I ever worked for and to hunt for the Jersey Devil. On to Baltimore to visit Edgar Allan Poe’s grave again on my way to see my grandkids, my oldest daughter and her family and, hopefully, a dear old friend. May 17ish I’ll be winding my way home, wondering if I packed enough into the last week. This entry was posted in #amreading, #AMWRITING, #KCLocal, #MakeItLocal, #Poetry, #ReadLocal. Bookmark the permalink. My good lord y’all are going to be whipping along at a superwoman rate! If I am on a long trip, I always forget something. So be sure to make a LIST. You will still forget something, though. Can’t wait to meet you in person! Hahahaha! The trick to forgetting less is to need less. But I’m sure I will miss something. One trip it was clean underwear I forgot so I spent the whole weekend trying to do sink laundry. It was a real dampener. …I should go now before I hurt someone. Probably myself :D Looking forward to hanging out over a few stories and drinks at Stokers!